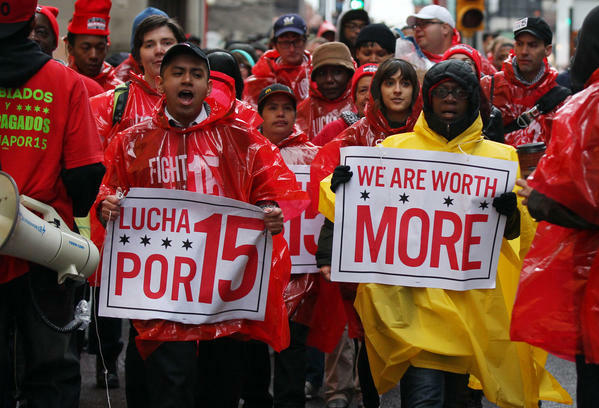 Fast food workers organizing for $15 and union recognition in the US won an important victory yesterday as the National Labor Relations Board (NLRB) ruled that McDonald’s could be held liable for labour violations in its franchise stores. Following a series of nation-wide 1-day strikes, workers filed close to 200 unfair labour practices claims against McDonald’s and its franchisees. The NLRB’s ruled that McDonald’s would be considered a joint employer as it investigates workers complaints. That means McDonald’s could be held responsible for unpaid wages and other labour law violations along with the franchise company. Fast food workers celebrated yesterday’s decision because it recognizes what many workers experience on a day to day basis, McDonald’s and other retail giants often call the shots down the sub-contracting chain. The decision gives new momentum to workers’ call for companies at the top to ensure fair wages and decent work for those selling, making and shipping their products. Here in Ontario, we have made the same arguments for joint responsibility for companies at the top of the sub-contracting chain. New legislation introduced earlier this month would hold companies that use temp agencies jointly liable for any unpaid wages and overtime violations that temp agency workers face on the job. As Bill 18 goes through the legislative process, we will be fighting to ensure this liability is extended to all ESA violations and not just wages and overtime. If passed, this would be another precedent-setting win for low-wage workers. Let’s join retail workers organizing for corporate accountability up the chain and make it happen here in Ontario!